Marvel The Black Widow: Creating the Avenging Super-Spy Book | Nerd Much? 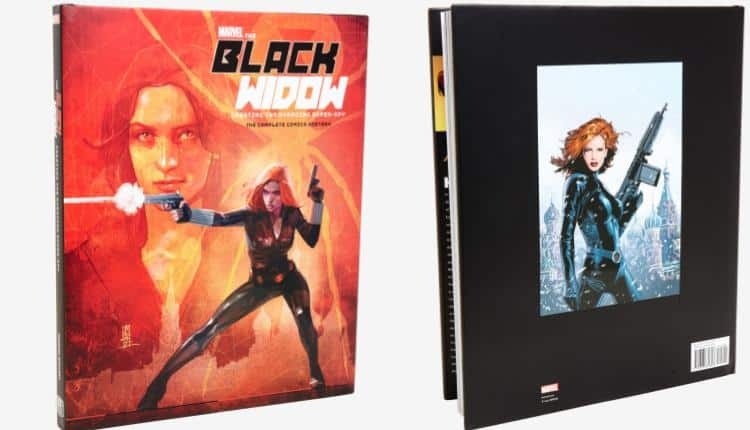 Marvel The Black Widow: Creating the Avenging Super-Spy Hardcover Book is 184 pages long, measuring 11″ by 14″. The book is fully illustrated and colored, with the high quality thick glossy pages reserved for such comic art books. The book itself is not just about the beautiful art, but a story about Black Widow as a character and how she evolved over time. Spanning 50 years, this book shows where Black Widow came from, who originally authored and drew her, all the way to today and movies she stars in. There are interviews with the writers and artists who created her anew over the years, explaining how they related to her and were inspired to either change her character or stick with the writers before them. Ever since Tales of Suspense #52, Black Widow captured the hearts of all Marvel fans. She did not have her famous costume at the time and despite playing the part of a fem fatale at the time, her wit and skills in espionage kept her coming back in future issues. Black Widow eventually got her solo issues, Amazing Adventures. She’s a badass woman with absolutely no time for romance at nearly the same rate as her compatriots in Sue Storm or Janet van Dyne. If you have only watched the movies, this book is sure to give you quite a bit of insight into Black Widow’s character. She comes from a long and interesting history, starting from a mere fem fatale all the way to the awesome spy she is today. Don Heck was the original artist and co-creator of Black Widow. He also created critically acclaimed characters like Hawkeye, Iron Man, the villainous Mandarin, and the Crimson Dynamo. That said, it was not until the 1970s that Black Widow donned the costume she has today. If you are worried that the 70s sexualized her even more, it is important to note that she started out as a fem fatale and her outfits reflected this – fishnet stockings and corset being a particular favorite. Want to learn more? Buy this lovely book and see it all laid out properly!